Today, you are a member of... Your Monsters - You Are A Member! Take the Loch Ness Monster, members. It debuted in 565 as a symbol of the vanquishing power of the big G when Saint Columba, Apostle of the Picts, came across a swimmer distressed by something scary in the waters Ness and, quicker than you can wave a cross and say ‘Noles ultra progredi, nec hominem tangas; retro citius revertere,’ drove the creature off. 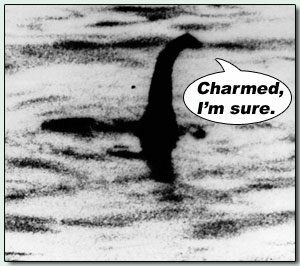 These days, Nessie ranks third in a triumvirate of anecdotal, scientifically spurious beasts returning again and again from the depths of our collective imagination. She still has believers, even though a 1993 deathbed confession by a man who admitted building the model revealed Colonel Robert Wilson’s 1934 ‘surgeon’s photo’ as fake. Point is, monsters have career trajectories just like the rest of us. What might have started off as something quite terrifying may now exist in semi-retirement as a familiar, if entertaining, fabulation. This week, don’t introduce the latter as the former. Unless of course you are in a cave grooving with a Pict.